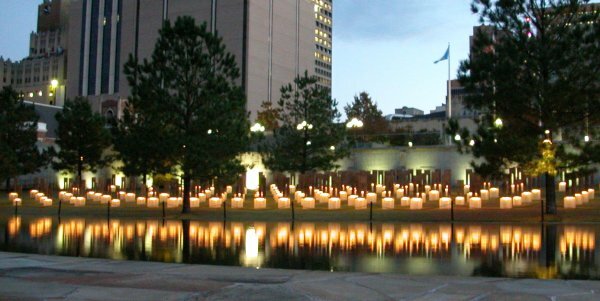 On this 12th aniversary, we remember the 168 victims (149 adults and 19 children), the survivors (30 children were orphaned), and their families of the Oklahoma City Bombing at 9:02 am on April 19, 1995. Our prayers still go out for you. Each of the 168 chairs, representing the victims of the bombing, are lit at night to remind us of the light within each and every soul. From across the reflecting pool, you can see how that light, even though the person it represents is not visible, still affects, and reflects, in us today. Please visit the Oklahoma City National Memorial if you ever pass through town. It will be time well spent.